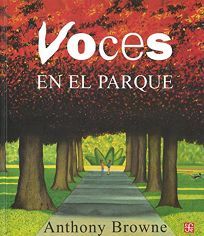 Gr 2-What makes Voices in the Park (Transworld Publishers, 1998) so very interesting is its use of insightful humor both in the text and in the illustrations. The book is comprised of one story told in four voices from four very different perspectives. A simple walk in the park is skillfully rendered from the point of view of each walker (a mother and her son, a father and his daughter). Each individual brings to the story his or her own worldview and preoccupation. The mother sees the walk through eyes filled with prejudice and fear. The boy is filled with shy timidity. The father is a despondent figure, while his daughter is all eager playfulness. The strangely static quality of the illustrations is offset by slyly inserted comic elements (e.g., a whale's tail in the tree line, a school of clouds shaped like fedoras, a tree in flames, tiny Mary Poppins figures floating in a dark sky). The Spanish translation has one or two rough spots where simpler words could have been chosen, but otherwise it is solidly rendered. Recommended for all collections. M.O.B.